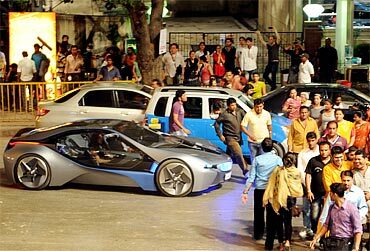 The shooting for the fourth installment of Tom Cruise starrer Mission Impossible took place in parts of South Mumbai recently, and we managed to get hold of some pictures despite the tight security and secrecy surrounding it. In this particular sequence, the shiney new BMW four-seater piqued the onlookers' interest, who thronged to take a look at the goings-on. The shoot took place through the night. And that's Tom Cruise's body double taking a breather between shots. 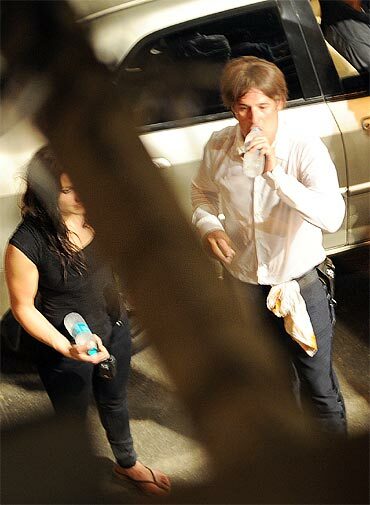 While Cruise himself hasn't come to shoot in India, his body double was spotted shooting in the city's bylanes. Mission Impossible 4: Ghost Protocol also stars actor Anil Kapoor and marks his debut in mainstream Hollywood. Reports claim that the second unit is shooting most of the outdoor and 'crowd' scenes in Mumbai. Aamir travels by auto in South Mumbai!